Saikat Guha is a researcher at Microsoft Research India. He is broadly interested in systems approaches to improving privacy and advertising online. He believes that privacy and profit are not conflicting ideas. His recent projects are focused on safeguarding user privacy in a way that does not disrupt the emerging business models behind the cloud, online social networks, and mobile ecosystems. 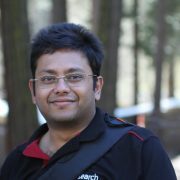 Saikat received his PhD from Cornell University in 2009 for integrating middleboxes into the Internet architecture. He authored the RFC that now serves as the best-practice for building TCP support in NATs and firewalls. He received his BS in computer science from Cornell University in 2003. In 2012, he was named one of MIT Technology Review’s TR-35 (35 young innovators under 35). Saikat is always on the lookout for bright PhD students who want to work with him. Past internships have all led to top-tier publications, real-world deployments, and measurable impact. Email him if you’re interested in working with him, or interning in Microsoft Research India.